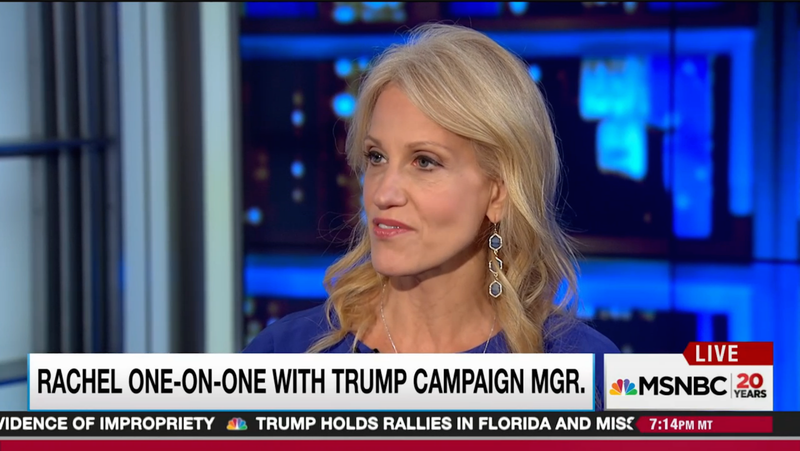 Would You Rather: Hear Trump's Campaign Manager Try to Defend His Policies or Get 1,000 Paper Cuts? TFW you are paid to defend a racist potato. Image via Screenshot. Kellyanne Conway (a.k.a. the new Paul Manafort) (a.k.a. the new, new Corey Lewandowski) appeared on The Rachel Maddow Show on Wednesday evening, presumably to speak about policy matters more eloquently than could, say, her gelatinous heap of a candidate, Donald Trump. Most upsetting, on both a visceral and content level, was Conway’s attempt to clarify Trump’s ever-evolving Muslim ban, which she said isn’t actually evolving at all. In December, Maddow said, Trump released a statement calling for “a total and complete shutdown of Muslims entering the United States until our country’s representatives can figure out what is going on.” Then, a week ago, he said he would “suspend immigration from regions that have a history of exporting terror.” This is confusing, because the terrorists who committed, say, the 9/11 attacks, came from Germany. Do the policies work together? Does one supplant the other? What the hell? “Is Germany a country from which we will not allow immigration anymore?” Maddow asked. “That was... before,” Conway responded. Wow, another edifying political discussion on the books!